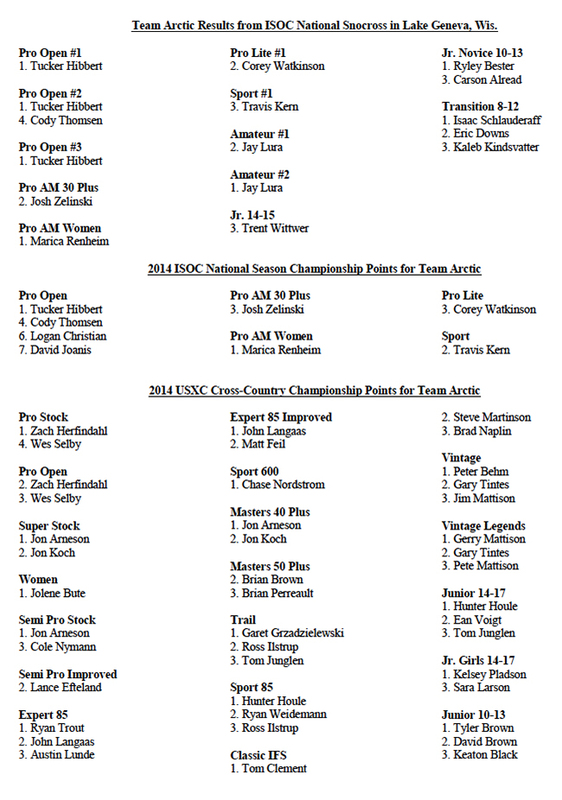 When the checkered flag flew to end the 2014 ISOC National snocross season in Lake Geneva, Wis., Team Arctic stood atop the podium with seven class wins, two class championships and a podium place in each of the five championship points classes. As the final event of ISOC National season, Lake Geneva saw another historic crushing of the Pro classes by Tucker Hibbert and Marica Renheim. Hibbert was victorious each of the three Pro Open finals, bringing his season win total to 15 out of 17 possible. Marica Renheim was equally impressive, staying undefeated in season finals to record her eighth win. In fact, Renheim lost only once the entire season: a heat race at the season-opener in Duluth. Having dominated their classes all season, Hibbert and Renheim also claimed their respective ISOC high point championship titles. In addition, Corey Watkinson capped an excellent season in Pro Lite with a third place overall title. Josh Zelinski did the same in Pro Am 30 Plus. And Travis Kern graciously accepted his second place point title in Sport despite being crashed out of the championship title by another racer at Lake Geneva while Kern was in third place, just two corners before the finish line. 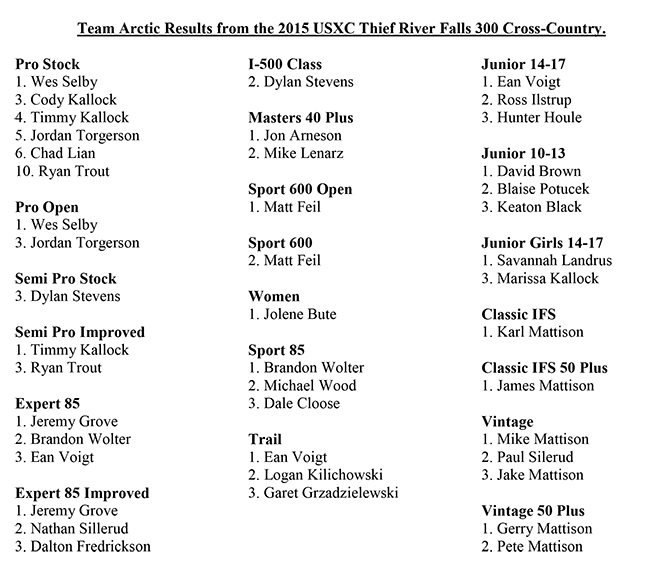 Team Arctic’s contingent of USXC cross-country racers cleaned house in the season championship points war, taking the title in 16 classes including eight podium sweeps and 42 out of 60 championship podium positions. Zach Herfindahl capped his remarkable sophomore season in the Pro class by winning the Pro Stock championship and taking a close second in the Pro Open chase. Jolene Bute won yet another Women’s class championship. And Jon Arneson captured three class championships, including the tough-fought Semi Pro Stock and all-new Super Stock classes. Arctic Cat returned to the top of the snocross scoreboard during the third and fourth round of the ISOC series in Bessemer, Michigan, where Team Arctic racers scored nine class victories in the combined National/Regional event. Leading the charge once again was the indomitable Tucker Hibbert, whose sweep of the Pro Open classes was as powerful as it was complete. Bolstering Team Arctic’s performance in the top classes in Bessemer were Joshua Zelinski and Matt Pichner. Zelinski scored a first and a third in the two Pro Am Plus 30 finals, while Matt Pichner took a bittersweet fourth in Pro Lite after having led for several laps. Also landing a strong performance in Bessemer was Travis Kern, who scored a third in Sport at the national event and a third in Pro Lite during the regional competition. In other classes, both Trent Wittwer and Evan Christian scored two wins apiece, while Ryan Trout and Ian Eboy Buchman nearly notched doubles of their own. And of the nine class finals won by Team Arctic racers, four were full podium sweeps. “We had a great weekend in Michigan and our new Sno Pro 600 with the ProCross chassis is working excellent,” said Kloety. “What we need now is for some of our racers to log some seat time before the next race, since many of them hadn’t ridden since the opener in Duluth. The next ISOC National Snocross is Jan. 4-5, 2013, at Canterbury Park in Shakopee, Minn.